The CLS-1000 chemical particle counter is a compression sampler combined with a Liquistat volumetric particle counter for measuring liquid chemicals up to 90 degrees C. Built-in safety features such as leak detection and purge air make it ideal for integration into a wet bench for use with dangerous solvents and acids. Designed for versatility and reliability, the system can be located on a cart for increased mobility when sampling from process to process. The compression sampler eliminates erratic data problems due to bubbles in effervescent or hot chemicals. The CLS-1000 chemical particle counter is fully compliant with the new SEMI C1 standard for particle measurement of process chemicals. Contact us for a quote or more information on chemical particle monitoring. Contact us if you need more information or have questions regarding chemical particle monitoring. Chemical Particle Counter: For batch sampling process chemicals at 0.1 micron sensitivity, Particle Measuring Systems offers a Chemical Liquid Sampler System, the Model CLS-1000. This system consists of a batch sampler, chemical particle sensor and personal computer for data collection and trend analysis. The CLS-1000 liquid particle counter provides a quick sample cycle for faster data collection and recovery time when particle anomalies occur. The volumetric sampling provided by the CLS-1000 chemical particle counting system allows for tighter process control, less data variability and accurate sizing information. This system is versatile - it samples cold and hot chemicals up to 90°C and uses a compression sampler for removing bubbles in effervescent chemicals and surfactants. The operator can also select the amount of fluid volume in the overflow burette at either 15 or 55 ml, making it cost-effective when sampling expensive chemicals. The CLS-1000 chemical particle counter has built-in safety features including leak detection sensors and fluid containment, along with a visible warning indicator to inform the operator of system malfunctions. The exterior surface is made from polypropylene and is resistant to most process chemicals, including hydrofluoric acid. Purge air also forces dangerous chemicals completely out of the enclosure. 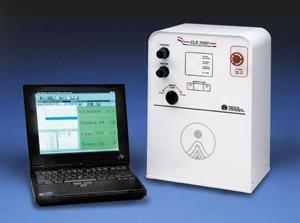 This chemical particle counter is CE certified.